I’ve been wanting some long tall kitties for a long time. When I ran across this artwork I knew these were it. 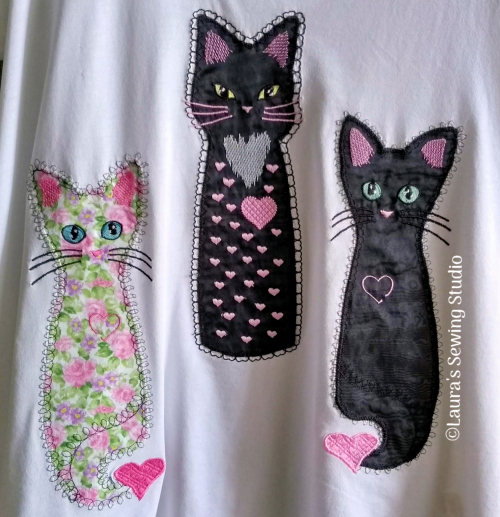 Because I wanted these on some very lightweight cotton jersey tunics, I used organza for the applique fabric and 1 lightweight cotton floral print. Almost all of the embroidery is located on the applique fabric with very little on the knit fabric itself. Therefore, I decided to use water soluble stabilizer on top and bottom instead of the usual cut away on the back. The appliques turned out very soft and drape with the fabric. I thought I would need to add a layer of light weight fusible to the backside to keep the embroidery threads from scratching me but nope, didn’t scratch me. Maybe because of the very fine embroidery bobbin thread I use? 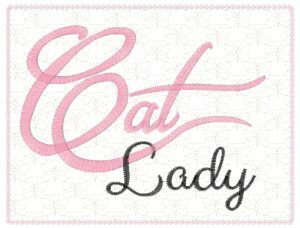 *Included in all sets is the BONUS ‘Cat Lady’ design – just in case you want to make a cat lady quilt banner to go with the Katz. 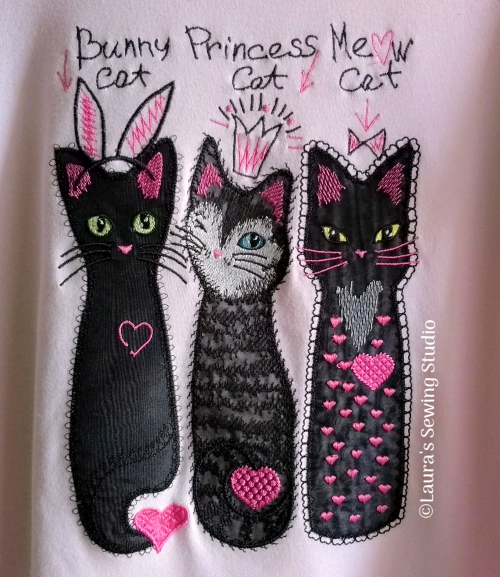 Madeira Polyneon embroidery threads – I used black, rose pink, and pink. For eyes I used gold, 2 shades of green (about 2 shades apart), two shades of aqua blue (about 2 shades apart), black, and white. *Thanks to Mari Martin for a clever name for this collection of ‘katz’.